Fresh rhubarb shows up at the farmer's markets and grocery stores in late spring and is only available for a short time. But if you would like to enjoy this vegetable year-round, freezing the stalks is a great option and the perfect way to preserve rhubarb. The beautiful thing is that frozen rhubarb works just as well as fresh in recipes like rhubarb compote. In order to end up with a quality product, there are a couple of steps you need to take before you freeze rhubarb. One is blanching the rhubarb stalks quickly in boiling water before freezing them, which ensures that they retain a good texture as well as their rosy color for when you use them later in a recipe. If you are harvesting your own rhubarb from the garden, be sure to cut off all of the toxic leafy green parts away from the leafstalk. Only the leafstalk is edible. If the rhubarb stalks have tough strings (common with field-grown varieties), remove the strings before chopping the stalks. The normal stringiness of the stalks softens during cooking, but it's best to remove tough strings before freezing or cooking. A single-layer initial freeze prevents the rhubarb pieces from clumping together. Having loose pieces will be to your advantage when, for example, you have a quart-size container of frozen rhubarb but need to take out only a cup of it for a recipe. The steps for blanching and freezing rhubarb are simple. Wash the rhubarb leafstalks in cold water. Cut the stalks into 1/2- to 1-inch pieces. Prepare a large pot of boiling water and fill a large bowl with ice and cold water for an ice bath. Immediately drain the rhubarb in a colander, then transfer it to the bowl of ice water. This stops the cooking process. Gently stir the pieces in the ice bath, and let them chill in the bath for about 2 minutes. Drain the rhubarb pieces well in the colander. Spread the blanched and chilled rhubarb pieces in a single layer on a baking sheet (if desired, line the baking sheet with parchment paper first). Put the pan in the freezer, uncovered, for about 2 hours. 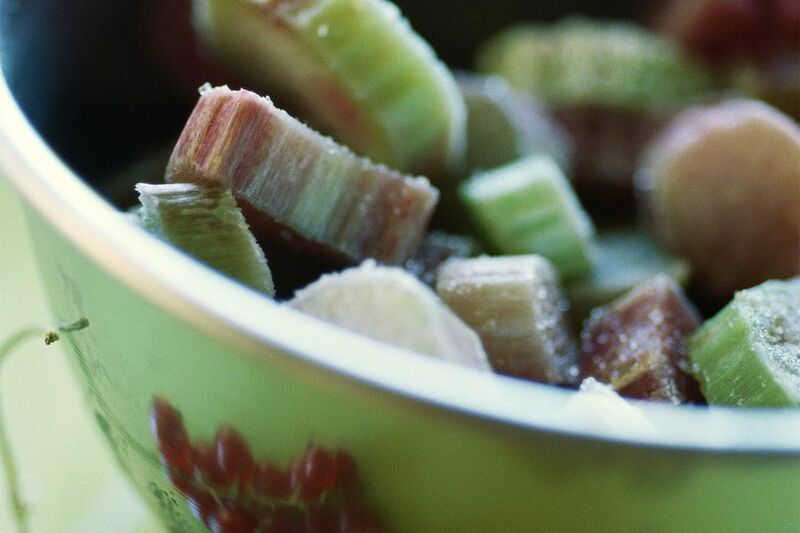 Transfer the frozen rhubarb to freezer bags or other airtight containers. Tightly seal the containers, and label them with the date. Rhubarb is one of the best things to freeze because you can use frozen rhubarb just as you would fresh. Because of the blanching step, the color of recipes made with frozen rhubarb will match the rosy color of the fresh leafstalks—and the tangy flavor will be just as terrific. It is not necessary to thaw frozen rhubarb before cooking with it, but if you are baking with rhubarb, it's best to thaw it first as it shrinks a bit after thawing and you want an accurate measurement. Frozen rhubarb will keep for 1 year. It is still safe to eat after that, but its quality will decline. One pound of fresh rhubarb yields about 3 cups of chopped pieces when it is raw or frozen; the same amount cooks down to about 2 cups.